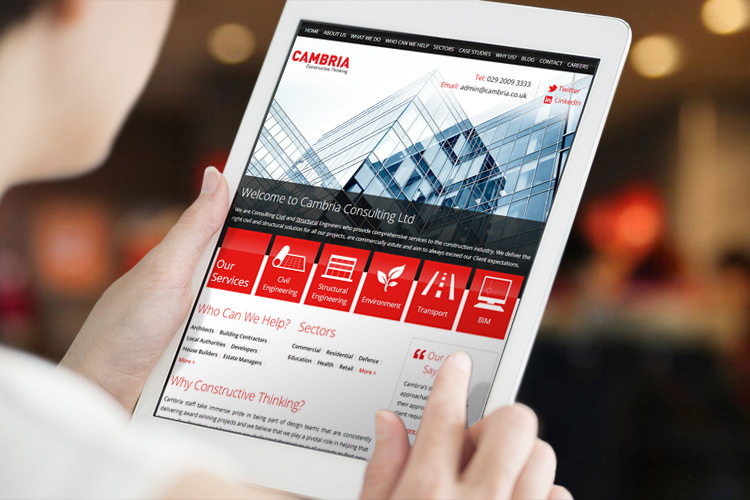 Cambria is a highly talented, civil and structural engineering company based in Cardiff. Like many of our clients, they first approached us because they knew they had massively outgrown their existing website. They also knew that, even though they weren’t selling online, that their website was important to them and their customers. They knew that potential customers and partners were validating them online. The opportunity was there to create a website experience which really resonated with their target audience; creating a marketing touch point which left a lasting, positive experience in the audiences’ mind. Our tried and trusted web design process ensured that we created a website experience which was built from the ground up to appeal to, and be of use to, Cambria’s potential clients. The website was based around a highly customised version of the WordPress platform with a bespoke design. The website works on smartphones and tablets etc. If you would like to contact us to discuss how your website can be improved, please do so – we’d love to hear from you.